It's only a week 'til Thanksgiving and five short weeks until Christmas. Now's the time to be placing orders for special die cuts like this sleigh that Lila decorated for us. Isn't it gorgeous? She used the sleigh die cut from Cappuccino Curious metallic cardstock for this sample, as well as the very sticky Killer Red Tacky Tape to keep it together. One great thing about ordering now is that there's a special sale going on! Just use coupon code winter0815 to save 15% off all orders over $25.00. The savings is valid through Monday, November 24th. This coupon code is good for everything in stock, so you could use it to purchase die-cut papers, full sheets of cardstock, Killer Red Tacky Tape, embellishments, etc. Also through Monday November 24th, we're accepting applications for Guest Designers. Please see this blog post for more details. Creative Cuts & More (CC&M) is a leader in the die cutting industry offering dies cut in cardstock and a variety of other materials like chipboard, acetate, felt, velvet paper, and more. We are searching for paper crafters who enjoy working with die cuts (shapes, cards, 3-D bags & boxes, etc.) to design projects for us as guests to our design team. If you can rock a die cut and take a great photo, please apply! Create 4 projects for CC&M from the materials provided (two of which will have an assigned theme). Any extra materials sent are yours to keep. Photograph your projects. Post photographs and product recipes to your blog, to Splitcoaststampers, Two Peas in a Bucket, and any other galleries of your choice. Submit same photo and product recipes directly to CC&M and grant CC&M permission to use them in CC&M’s blog, Web site, etc. We’ll want to show off our very favorite projects at trade shows, so we might ask you to either send us the original or make a duplicate. You will be reimbursed for postage in either case. Once the projects have been submitted, you will receive a gift certificate for $20 in free die cuts of your choice from the CC&M Web site. You will also be eligible for a 25% discount on any purchases you make at that time. Other papercrafting experience (Publications, Teaching at LSS, etc.)? What would make you a great choice as a guest designer? Please e-mail Terry at customerservice@creativecutsandmore.com and put “Guest Design Team Call” in the subject line. Submissions close on November 24th, and notifications will go out by December 1st. Tacky Shapes were introduced in our last post via the sparkly spiders on Lila's coffin box. She chose glitter to cover her spiders. Many other materials are suitable for use with the Tacky Shapes, including microbeads, flock, and today's idea: gold leafing. For both cards, the top protective layer over the Tacky Tape was removed to reveal the adhesive. I selected the more copper-looking pieces from the package of leafing and applied those to the stem. Then I applied the more orange pieces to the pumpkin itself. Using my index finger, I worked in the leafing and use a paintbrush to brush the flakes back into the container. Remember, this Pumpkin cut from cardstock or other materials could make a fun addition to holiday place settings and room decor! There is still time to win this month's drawing. Click the link to find out how! Thank you for joining us today, and we'll see you again soon! Looking for some fabulous ideas for Halloween gifts & goodies? There's still plenty of time to order from Creative Cuts & More! For this creation, Lila used the exclusive coffin box die cut out of Bazzill Bling Flirty cardstock. She also made spectacular use of spiders cut from two-sided Tacky Tape and covered them with Beetle Black Doodlebug Glitter. Aren't they perfectly spooky? 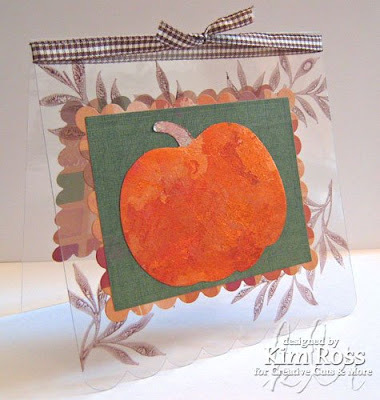 Win Free Die Cuts… Every Month! We would love to see your projects! Post them on the Web and win! 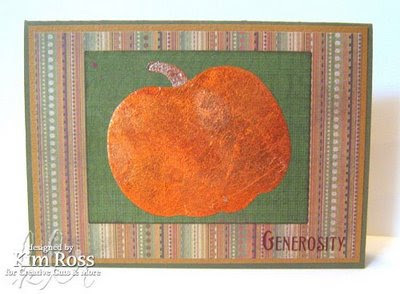 * Create a project using one or more dies from Creative Cuts & More. * You can get more chances to win by posting your project in more places. For example, linking to your blog earns one entry and uploading your project to a gallery earns another. Each post can only be entered once. * Drawings will be held each month on the 15th. This is a new way to win... and it is still valid for any postings or uploads you made in the past, too. If you haven't already done so, just go back and edit your original post to add a link to Creative Cuts & More and then e-mail us a link to each posting. The grand prize each month is $15 in free die cuts -- your choice! I know it has been a while but I am back. I am going to be spotlighting some of the great samples I receive from my design team members and customers. Today's is from Deb McNett, a member of the Creative Cuts & More design team. This sample was made with our Diaper Card with Pin and our A2 Card. I wanted to spotlight this card because Deb was able to enhance the die cut in ways that we had not thought of. First, Deb mounted the diaper card onto an A2 card. Then she added that cute trim to the diaper by using a pair of decorative shears. Then she made her inner piece by cutting it to fit into the diaper card. Stay tuned for more innovative ideas and designs! I'm Finally Joining the Blogging World!!!!!!! Well, here is my first tiny step into the world of blogging. First, a little about me. In 1994, I came across a cart in a shopping mall selling rubber stamps. My daughter and I immediately loved all the stamps and couldn’t wait to get home and start making our Christmas cards. Here it is fourteen years later, and my love affair with stamps is still going strong. As I became more and more involved with paper crafting, I was frustrated by the tedious job of measuring and cutting templates to make 3-D containers and more complicated movement cards. I discovered die companies that made machines and dies in all kinds of varieties. From that, Creative Cuts & More (www.creativecutsandmore.com) was born. Since then, not only do we offer die cut cards, boxes etc but we design our own exclusive line of die cuts. 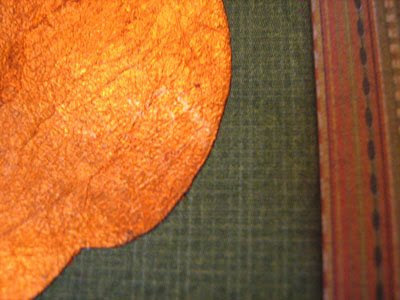 We also offer our die cuts in the widest variety of materials from cardstock to chipboard to acetate to felt. I am hoping to be able to share lots of creative ideas, tips, techniques and projects using die cuts and the other products we carry. I will post sneak peaks of new samples created by my very talented design team. Will also have sneak peaks of new die cuts, new products, new classes and new kits. I hope you will find some inspiration from my blog as I have found so much inspiration from the blogs I have visited.